“We often picture the Earth’s mantle as a liquid that flows but it isn’t – it’s a solid that moves very slowly over time. Traditionally, it’s been thought that the flow of rock in Earth’s lower mantle is sluggish until you hit the planet’s core, with most dynamic action happening in the upper mantle which only goes to a depth of 660 km. We’ve shown this isn’t the case after all in large regions deep beneath the South Pacific Rim and South America,” explained lead author, Dr Ana Ferreira (UCL Earth Sciences and Universidade de Lisboa). “Here, the same mechanism we see causing movement and deformation in the hot, pressurised rock in the upper mantle is also occurring in the lower mantle. If this increased activity is happening uniformly over the globe, Earth could be cooling more rapidly than we previously thought”, added Dr Manuele Faccenda, Universita di Padova. 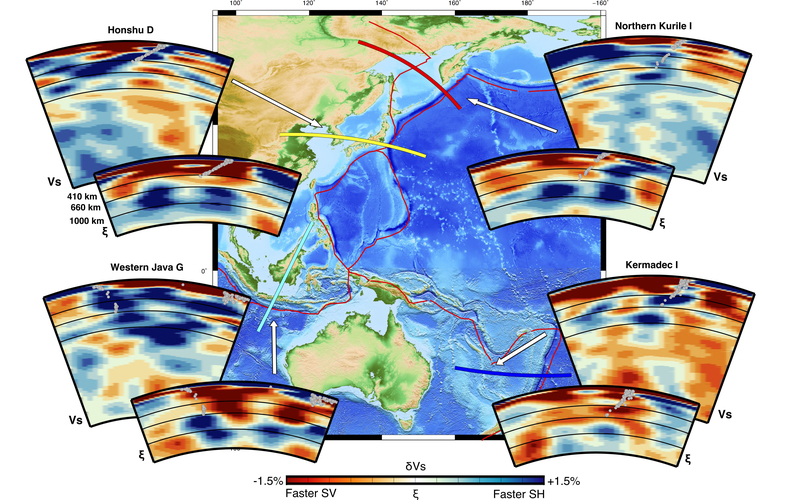 The study, published today in Nature Geoscience by researchers from UCL, Universidade de Lisboa, Universita di Padova, Kangwon National University and Tel Aviv University, provides evidence of dynamic movement in the Earth’s lower mantle where ancient ocean floors are plunging towards the planet’s core, crossing from the upper mantle (up to ~660 km below the crust) to the lower mantle (~660 – 1,200 km deep). By combining 43 million seismic data measurements with dynamic computer simulations using the UK’s supercomputing facilities HECToR, Archer and the Italian Galileo Computing Cluster, CINECA the researchers generated images to map how the Earth's mantle flows at depths of ~1,200 km beneath our feet. Cross-sections of Earth’s mantle down to 1,400 km depth showing changes in its flow as ancient ocean beds fall into Earth’s deep interior credit: Ana M. G. Ferreira et al.